Congressman M.C. Tarver describes his delight over having pictures of the Berry Schools recently framed and hung in his office. 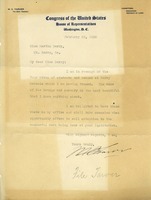 A letter in reply to Martha Berry from Congressman M.C. Tarver (7th Dist. of Georgia). He requests pictures of the school and/or students to hang in his office so that he may show others the wonderful work of the Berry Schools. 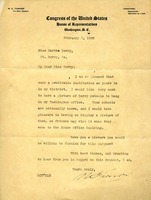 Berry responds to Tarver's request for a photograph of the Berry Schools with a photograph of a group of students. M.C. 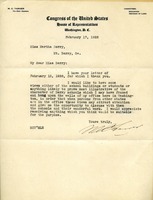 Tarver, member of the U.S. House of Representatives for Georgia's 7th district, requests a picture of the schools for his office in Washington, DC.